With an opioid crisis taking thousands of lives across the country every year, scientists are looking closely at the drugs involved: fentanyl, Oxycodone and heroin, among others. But improving our understanding of the brain’s reward system may shed light on why people become addicted in the first place, says Gehan Senthinathan, a PhD candidate in Behavioural Neuroscience at Wilfrid Laurier University. In the lab, Senthinathan uses rats to study how and when behaviours become addictive. He gives rats access to sugar on different schedules and in different concentrations, studies their behaviour, and then analyzes their brains under a microscope. 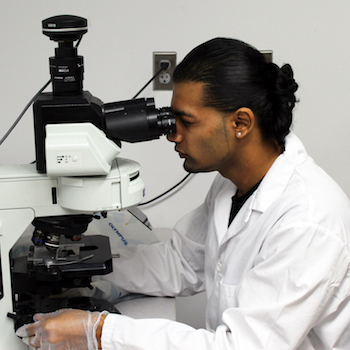 “Because drugs of abuse and natural rewards are processed by shared brain areas, we can approach the complex study of addiction with something as simple as sugar,” says Senthinathan, who shared his research in a winning presentation at Laurier’s Three Minute Thesis competition March 28. Since he’s studying the brain’s reward system, rather than a particular drug, Senthinathan’s findings can not only further our understanding of drug addiction, but also obesity, problem gambling and even romantic love. In the lab, Senthinathan has found that, when sugar is offered only intermittently, rats will eat more. They also begin to show addictive behaviours, like binging, and those behaviours linger, even when sugar is offered regularly again. Other researchers have found that rats that binge on sugar are more likely to become addicted to other substances, such as cocaine. Senthinathan is also studying how age plays into the equation. Young rats, he’s finding, do not develop these addictive behaviours until around adolescence. These findings might explain why we don’t typically see addictions in children and why adolescence is associated with increased risk-taking, including drug use. They also underline the importance of developing good habits in childhood. Senthinathan represented Laurier at the provincial Three Minute Thesis competition at York University on April 19.